Flat website design allows your business or brand to standout without all the bells and whistles in your website. Despite the absence of additional embellishments, flat design still looks attractive and charming. With flat design theme’s plain and very straightforward design, you are able to clearly communicate your message to your target audience. Actually, flat design themes do not completely lack visual effects. Flat design themes are just short of added bevels, drop shadows, embossing, gradients or other elements that produces three-dimensional effects to your website. The icons and UI elements looks crisp without three-dimensional effects. Flat design themes are regarded as a more sophisticated version of minimalist themes. Flat website design has been around for quite a while and it continues to gain popularity in web design industry. It eliminates lots of complex textures, patterns, shadows, bubbles, gradients and other 3D effects to focus on simplicity. A lot of developers and website owners use flat design themes because it recognizes the two-dimensional nature of screen design. Instead of using astounding 3D effects, they make the most of the theme’s straightforward and flat design to create a vibrant, modern and interactive website for their business or company. Besides, flat design theme could improve the usability of your website. Most importantly, flat design theme is fully responsive, mobile ready and easy to access on desktop, smartphones or iPad. If you are planning to build a new website, these free flat design themes could help you give your site a fresh and modern look. These specially selected free flat design themes use lively colors, typography, a lot of white space and a strict grid system for a clean and functional interface. Activello is a very easy to use and incredibly intuitive, luminously bright and wonderfully well-structured, colorful and vibrant, aesthetically minimalist and uncluttered, feature-rich and highly functional, tech-savvy and resourceful responsive WordPress multipurpose theme. It is a strong and flexible theme that has been designed to effortlessly muscle the demands of all sorts of websites, but that uniquely stands out as an excellent match for all sorts of fitness and fitness related websites. Whether you are a fitness aficionado, a cross-trainer, a professional athlete or a gym or spa, Activello has you covered. 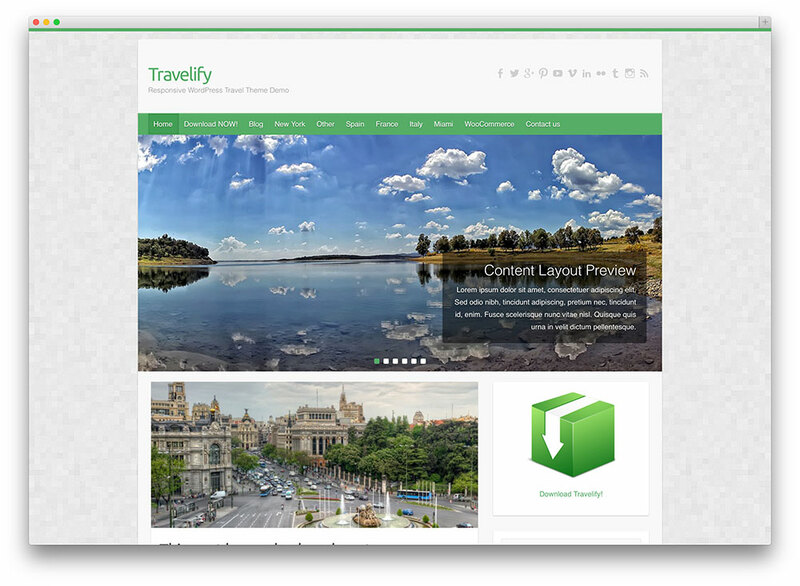 Spacious WordPress theme lives up to its name, it is spacious and offers a large platform for your content. Spacious’ flat design and flexible layout is perfect for building blog, portfolio or business website. Its fully responsive layout automatically adapts on all types of devices from desktop computers, tablets, smartphone or iPhone. It offers a lot of customization options given its multiple page layouts that provide utmost flexibility as well as six different page templates, and 13 widget areas. It also includes five custom widgets apt for creating business-oriented sites. Its features such as slider, a boxed and a wide layout, a light and a dark color skin, and a color scheme option that you can use in designing a decent website for your business or portfolio site. Fullby is a beautiful and modern WordPress theme designed after Twenty Fourteen. Even at first glance you will appreciate the magnificence of this new free magazine-type theme. This theme is fully responsive, built based on Bootstrap and features a grid style. It includes only two images and can be edited via CSS. 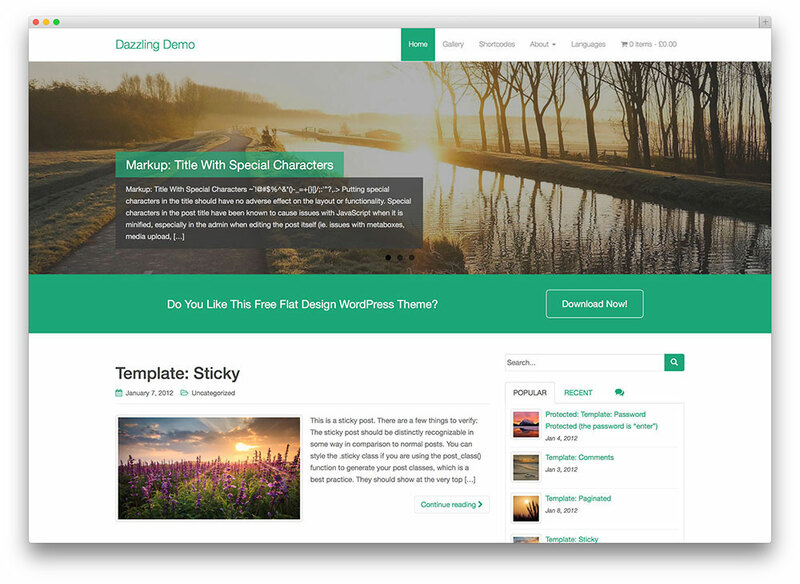 This flat design theme provides several column layouts and features a dynamic platform for your content. If you want to include your latest post to the featured section, simply mark the “featured” option in your post. 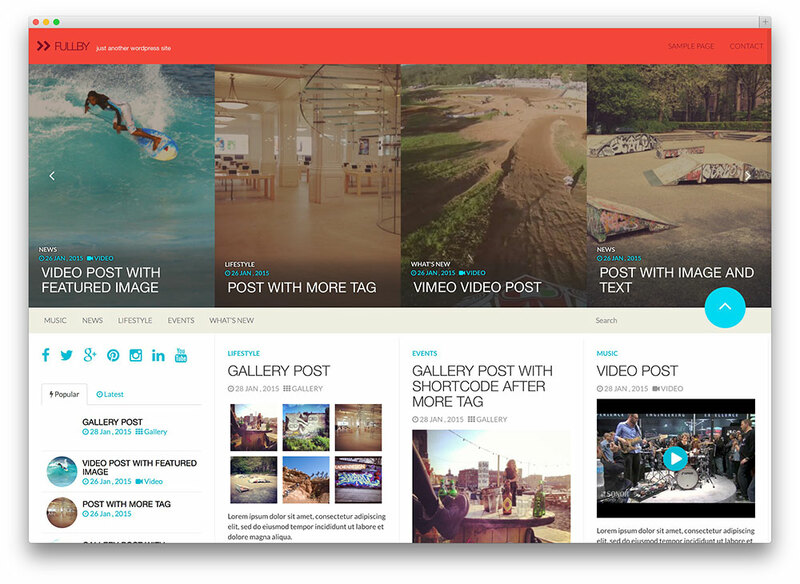 It also comes with incredible gallery and video support that you can use for creating an exceptional website. Additionally, Fullby makes your website accessible and fully functional on different screen size.